We have been in coop building mode, which involves rebuilding our original 1920s shed, and then building a new structure off of that. Of course we needed to bobcat the property and remove all the crap. One can of worms opens another. 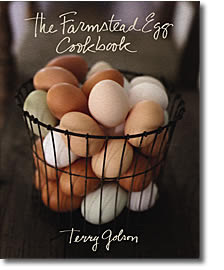 I am very grateful to Terry Golson, a neighbor and chicken aficionado, who inspired me with her Farmstead Egg Cookbook. 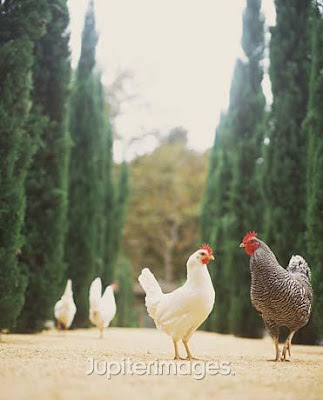 In case you want to know more about my chicken adventures, please check out the Monument Street Coop! Now that Domino has been retired (still so sad), I eagerly await my only non-Martha Stewart decorating subscription, House Beautiful. Sometimes there are vestiges of stodginess, but I am frequently surprised by how comfortable the designs are. 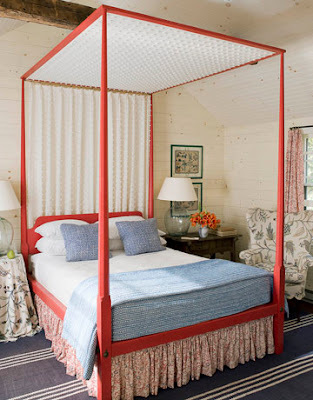 I particularly loved a house designed by Tom Scheerer in this month's article, Cozy is a Mix. 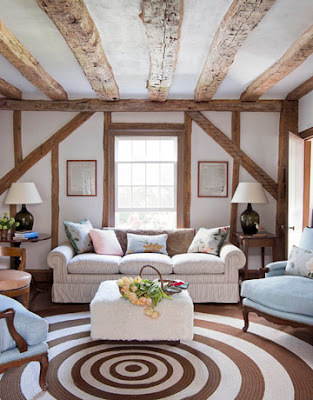 I love how the architecture of this rug pulls the whole room together and invites conversation. Obviously the home's bones are beautiful, but the designer has respectfully designed to enhance them. 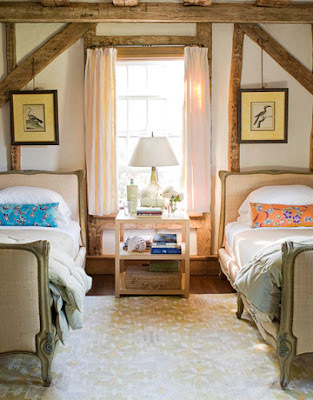 Love the rug, love the beds, love the mismatched pillows. It's decorated, but it looks like a family actually LIVES here. I give House Beautiful a lot of props for showing this kind of livable decor. Go go go! 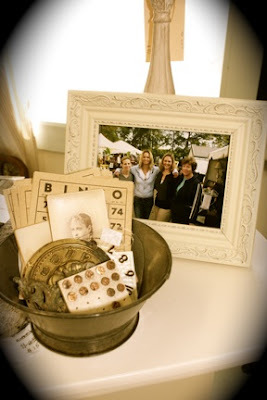 There is a multi-dealer shop in Concord called North Bridge Antiques. Compared to some of my go-to resources in town (Thoreauly Antiques, Nesting on Main), this shop was rather sad. 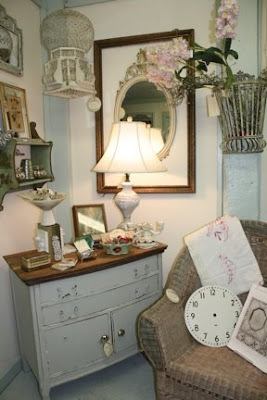 However one bright spot was there - Antique Therapy. Unfortunately I went into the shop the other day and this dealer was gone! Good luck Keri! I look forward to seeing you at your new location! On President's Day weekend (I know, I'm a little slow on the draw), my parents generously agreed to babysit and Tim and I escaped to the antiquing mecca of York, Maine. Rather it started out as a trip to York, and morphed into an adventure up Route 1 that included Ogunquit, Wells and Kennebunkport. This trip is what antiquing used to be before the days of Ebay. Mind you, I've found plenty of fabulous things on Ebay, but the thrill of the hunt (and the tactile experience of course) is not the same as visiting a new discovery or an old haunt. But I digress. We drove up to Maine with our trusty GPS and absolutely no plan (unlike us). Our first stop at Bob Withington Antiques (611 Route 1, York) was a mecca. I wanted everything - but the large pieces weren't what I needed unfortunately. Still, the gorgeous mix of traditional antiques with industrial with primitive was exactly what I was looking for. I loved this zinc top table (I believe around $900)... nowhere to put it now that we have an island. The set of red-topped stools would be adorable outdoors. I adore tramp art, and loved the juxtaposition of this chest with the industrial factory lights. On the right, the spindle day bed ($475) was in perfect condition and priced right. Love the nautical lanterns too! I LOVED this Amelia Earhart (or whomever it was), the needlepoint stool and the pair of industrial swivel chairs. And look at this gorgeous slate top table. Reminds me of Ken Fulk's table featured in House Beautiful. A fabulous discovery at Withington? A MAP that edits out the hundreds of shops along this stretch of Route 1 to the more edited, upscale dealers who truly specialize in the sale of quality antiques. I haven't been able to find this map anywhere online, so I am happy to share it (make sure you click on the images to enlarge!!!!). The map is a great guide, but be forewarned that there are no addresses (thus the reason I've added them), and the map is not to scale so it's difficult to judge the distances between each destination. I would recommend printing out directions between your selections or using a GPS. Our next stop was the York Antiques Gallery (746 Route 1, York) which is a multi-dealer store housed in a barn. For a multi-dealer space, this place had consistently high quality items, but prices on the high side. Particularly in comparison with Withington, which had just a lovely selection at extraordinarily fair prices. However it still had wonderful pieces and is definitely worth a visit. One of my favorite finds was this pair of armchairs with carved dog heads. They were too fabulous, but at $900/each and then the cost of upholstery, a little much considering I had nowhere to put them. But they are so fun and were very comfortable. I also loved this painted Gustavian table. Perfect as a desk or in our bedroom. Again, too deep for any of my spaces but so pretty. I'm always on the lookout for trade signs or signs with interesting fonts. It's my graphic design background I suppose. I loved this wood 1882 sign (if our house hadn't been built in 1881 or 1878, take your pick). In Rhode Island they call the wooden folding table at right a "clambake table" but I believe this one had the moniker "harvest table." I also loved the antique croquet set. Fun to display on a wall or a sideboard. A beautiful partner desk with a lovingly cared for leather top. The dealer at right had a wonderful work table and a collection of painted trade signs. I also loved the child's Adirondack chair. A vintage school map, probably from the 1950s with the "middle Congo" still there. Perfect for a child's room or playroom. And this very sweet folk art for the Bi-Centennial. Living in Concord, it was hard to resist! 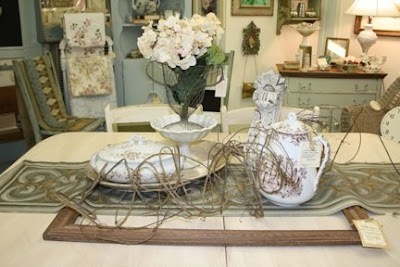 Our next stop was R. Jorgensen Antiques (502 Post Rd. U.S. Rte 1, Wells). I'll warn you, this shop is not for those with lean wallets. But what an incredible selection of fine European antiques. You can browse many of their pieces online, but it's a pleasure to wander through both the house and barn and dream of this exquisite furniture that will be the anchors of your design. Two of my favorite pieces? First, this English Girandole Mirror. 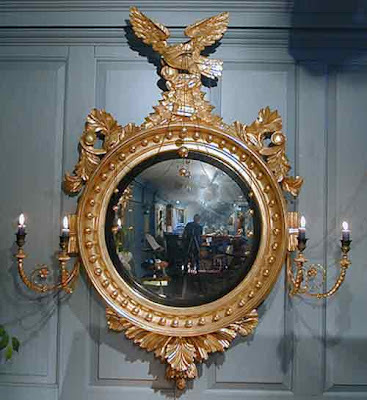 I have seen these Regency mirrors before, but in this piece the eagle is holding chains in its beak (which have balls connected to them). It's truly fabulous for someone with a Federal-style home. 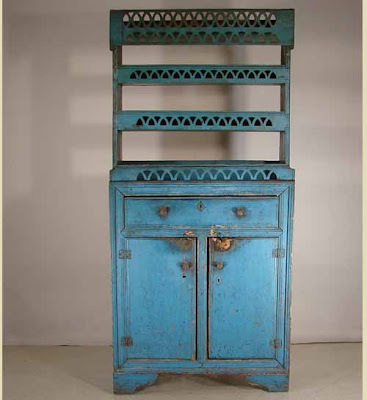 My other favorite piece was this blue painted cupboard. He had a tremendous selection of beautiful stepbacks, but this one with the original blue paint and decorative lattice was special. Our last stop? 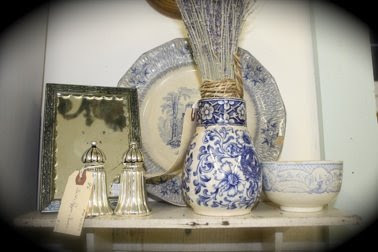 Wells Union Antiques (1755 Post Road, Rte 1, Wells). This is also a multi-dealer collection of 9 shops. Unfortunately most of them were closed in the dead of winter. However the two we visited had a selection that really mirrored my style - antique wicker and garden furniture, slate-top sideboards and edited industrial pieces. I loved this laboratory/chem lab cabinet fitted with slate top (not to mention the collection of tin boxes displayed on top). It was about 7 inches too long for my sideboard needs, very very sadly. And a shot of the whole shop (note the diamond painted floors)... go for the wicker! I can't fit any more in my house. We also visited MacDougall-Gionet Antiques, but it was disappointing after Withington and R. Jorensen and housed deceptively in a drool-worthy antique barn. And we drove all the way up to Antiques on Nine (a summery, coastal drive even in the middle of winter), but it was closed. We were lucky that so many of the dealers were open and I'd suggest a call if you're planning a trip! Scratch that. Calling ruins the adventure, and you can tell I love one. Happy antiquing!